Oh my goodness, it is October. Oh my goodness, it is fall! That means pumpkins. Which leads to pumpkin flavored everything (yum!) and made-from-scratch pumpkin pie! It also means nights curled up under the blankets reading good books. I think I have turned into a little bit of a D&D nerd after being privileged to read the Wizards of the Coasts new Forgotten Realms series, The Sundering. I found the overall experience with the series fascinating and a good point to jump into the D&D world. I realize that the Forgotten Realms have existed well before my introduction, but I feel Wizards of the Coast has set up a great point for newbies to jump into the genre. 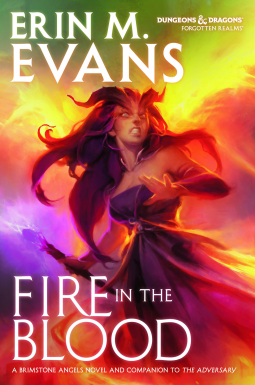 I was pleased to see that I would be able to continue with the story arc Ms. Evans had created in The Adversary (for which you can read my review here). Now that I am more familiar with the landscape and culture, this novel was much easier to get into from the beginning. I already knew the characters and knew where they were coming from situationally. It was an excellent book right from the beginning. These are probably a little more geared to the female reader with a love story for every kind and stage of relationship, but there is no lack of action for the male reader to enjoy. There are knights, wizards, and dragons for instance. Honestly, the love stories aren't your sappy romance love stories either. War is coming and their is intrigue afoot in the court. We get to see more from the Chosen started in The Sundering. All your typical fantasy plot lines and character types, but more awesome than usual to me. I actually found it very refreshing to see all the dysfunctional relationships and the issues that are very real to humans. This may be epic fantasy, but it doesn't have to be unbelievable. Relationships fall apart and build back up. There are miscommunications of massive proportion in real life. But, there are also all the sweet, romantic moments that make up for the heartache and worry. This book was fast paced and I was a little disappointed when I got to the end. There is a cliffhanger, which I find to be good--it means there are more good books to come, and that is exciting. Check out this awesome website to learn all you need to know about the book, author, her bibliography, and the RELEASE PARTY!